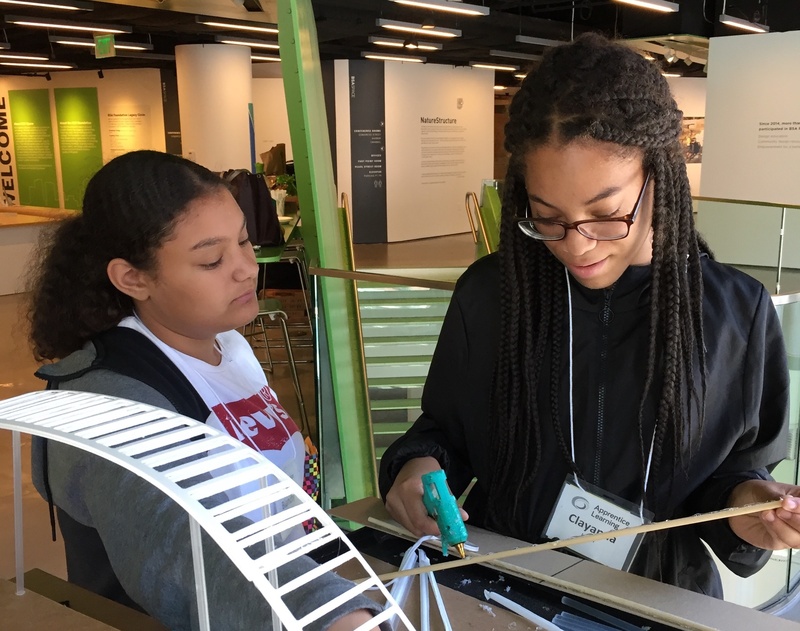 Rising ninth grade girls from the Apprentice Learning City Summer Internship program visited BSA Space in July as part of Summer STEAM, a new BSA Foundation initiative that served over 150 students with hands-on real world-problem solving. The students tackled the challenge of replacing the Northern Avenue Bridge in a way that can ease mobility in the neighborhood and, at the same time, create a community asset. The workshop began with a site visit to the bridge to learn its history and understand its context. Back at BSA Space, the students tested potential structural systems and then began brainstorming solutions to the challenge that the city has laid out: to create a bridge that improves mobility, honors history, strengthens resiliency, and creates a destination for the neighborhood. The students drew and then built models of their ideas and presented them to a panel of architects. The panel praised the students for their ingenious and elegant solutions – an open-air museum highlighting the city’s industrial past, a café that serves greens grown on an adjacent garden on the channel, and an interactive installation for local artists’ work. Inclusiveness was a recurring theme with the students being most interested in creating a place that welcomes everyone – Bostonians from every neighborhood as well as visitors to the city. The designs will be shared with the Mayor’s Advisory Task Force for the project. Summer STEAM is supported in part by a K-8 Learning By Design grant, a program developed by the American Institute of Architects (AIA) and funded by the Armstrong World Industries (AWI) Foundation.